Victoria has a secret…women love football. Almost as much as men do. Women account for an estimated 44% of the NFL fan base. But no one has to whisper that in Dallas Cowboys Owner Jerry Jones’ ear. He already knows…and he’s capitalizing on it. Victoria’s Secret opened a new Pink store Monday in Arlington, Texas. While that in and of itself is not remarkable, the fact that it’s in Cowboy Stadium is. Yes, The Palace in Dallas is already home to the second most valuable sports franchise and the second largest television screen…in the world. And it now houses the only Pink stadium store…in the world. Victoria’s Secret Pink partnered with the NFL and its 32 teams to sell licensed female fan apparel in 2011. The line has been a huge hit with football loving females who want to represent their team in a stylish and feminine way. A ribbon cutting (complete with Victoria’s Secret models) was held before the Cowboys hosted the Chicago Bears on Monday Night Football this week. It may have been the only thing Cowboys fans had to celebrate that night. Quarterback Tony Romo threw five interceptions and the Cowboys were pummeled by the Bears 34-18. But there were no reports of female fans rushing to return their Cowboys apparel. They’re in it for the long haul, win or lose. We don’t know whether Victoria’s Secret plans include other NFL stadiums, but we certainly hope so. Because there’s only one thing we love more than football…our football team. Whatever you think about the Cowboys, you have to admit…Jerry Jones is one good business man. The guy gets it. This entry was posted in Cowboys, NFL and tagged Jerry Jones, pink, Victoria's Secret. What Do We Think About the NFL in Pink? Well, here we are. A few days into October and Breast Cancer Awareness Month, and already with the whining…“A whole month of pink? Isn’t a week enough?” Mostly from men…sportscaster and media types who will remain nameless, but also from fans. The NFL first embraced pink in 2009. Since then, its partnership with the American Cancer Society, A Crucial Catch, has grown rapidly and made significant inroads in breast cancer prevention, education, and detection in NFL communities and nationwide. All pink items worn and used by players and coaches are auctioned off by the NFL, with the funds going to support outreach for screenings in underprivileged communities. Some say it’s yet another example of the NFL going “soft.” Others say there are different causes the NFL should embrace, either in addition to or in place of breast cancer. Maybe they just don’t like pink. You know what I have to say to them? Shut up. Women make up a reported 44% of the NFL’s fan base. Breast cancer is a huge problem in the lower income African-American population. Breast cancer has affected everyone in some way and will continue to at alarming rates until we can pinpoint a cure. And detection is a big part of that. And a big part of detection is knowledge. And that’s what the NFL is doing, educating women. The women who love the NFL are the same women who hauled their children, grandchildren, siblings, nephews, and neighbors out to the field and watched them play in the pouring rain. They are the women who sacrificed everything so their sons could play football in high school and get a scholarship to college. They are the women who thought they would be enjoying retirement and are instead raising their children’s children. Without these women, many of the players we love wouldn’t even be on the field. These are the women who sacrificed their dreams so their children could pursue their own. And make our dreams as fans come true. So, a whole month of pink? Yes. I think we can do that for them. Truth be told, it should probably be a whole season. And if the men want an NFL campaign for prostate cancer, we will embrace that too. We will wear blue ribbons and “Feel Your Balls” t-shirts if that’s what they want. 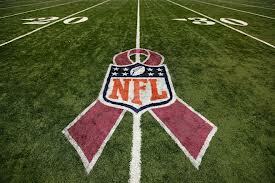 This entry was posted in NFL and tagged Breast Cancer Awareness Month, pink, Think Pink.